All hell breaks loose this Christmas in the Carelse home as Lindsay takes her new boyfriend Ashton home for the Christmas holidays in Cape Town. Her staunch Pentecostal dad kicks up a fuss and like most fathers, makes his presence felt. The Factory SA brings you a hilarious Christmas Drama Production this December the second at 7PM at the Crystal Auditorium. The production includes musical performances by Idols SA’s Crashadra and Rhema Varrie taking you back to golden oldies like Tis the season to be jolly and Jingle Bells. 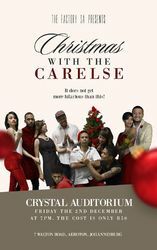 Crystal Auditorium – Friday 2nd December, 7PM. The cost is only R50pp. Christmas with the Carelse! It does not get more hilarious than this.